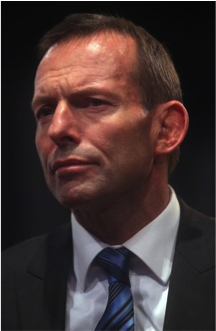 Tony Abbot– Tony Abbott, Australian Prime Minister. Australia has one of the world’s strictest detention regimes. This is despite it being one of the wealthiest nations in the world, and the relatively small fraction of asylum seekers seeking refuge there (approximately 4%). Over the past decade Australia’s policies relating to the treatment of asylum seekers have progressively tightened, coming to light most recently under the current Abbott Government’s ‘Operation Sovereign Borders’ mandate with its strong focus on ‘border protection’. The result is a deep-seated attitude of dehumanization and alienation of asylum seekers who are portrayed as a threat to Australia. Most troubling is Australia’s controversial policies to ‘stop the boats’, turning boats of asylum seekers away, particularly back to Indonesia which has become a hothouse stopping ground for people seeking refuge in Australia. Those that do successfully reach Australia are sent to third country processing detention centres in Manus Island, Nauru Island and Christmas Island, where individuals seeking refuge endure atrocious health (both mental and physical) and sanitation conditions in overcrowded and inadequate accommodation facilities. “Everyone has the right to seek and to enjoy in other countries asylum from persecution” – Article 14, Universal Declaration of Human Rights. The UN Refugee Agency (UNHCR) has recognized the institution of asylum from persecution, as enshrined in Article 14 of the Universal Declaration of Human Rights, to be among the most basic mechanisms for the protection of refugees. Moreover, many of the other international obligations to which Australia is party to, such as the ICCPR, ICESCR and the CRC have been held by the International Court of Justice as being applicable to acts done by a State in the exercise of its jurisdiction even outside its own territory, if it has effective control over the situation. Yet Australia’s policies and treatment of asylum seekers continue to violate its international obligations, most notably the principles of non-refoulement, inhuman or degrading treatment, and economic and social rights. It is important to note, however, that whilst Australia is party to a number of international human rights treaties, they have not been implemented by legislation. ‘Operation Sovereign Borders’ is the term coined by Tony Abbott in his initiative to restrict immigration into Australia by what has been officially described as a ‘military-led, border security operation supported and assisted by a wide range of federal government agencies’. Heading the operation is three star Lieutenant General Angus Campbell, reporting to Immigration Minister Scott Morrison. 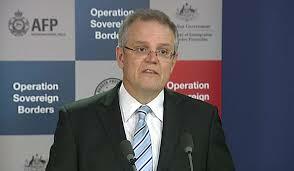 “Our resolve to implement what we have promised the Australian people, to stop the boats, is absolute. Those seeking to come on boats will not be getting what they have come for. They will be met by a broad chain of measures end to end that are designed to deter, to disrupt, to prevent their entry from Australia and certainly to ensure they are not settled in Australia”. The attitude taken by the government has been the subject of great controversy due to its seeming ignorance of asylum seekers as a humanitarian issue rather than a security emergency. Of significance are the combative language used in titles given to the various task groups in the chain of command, which send a clear message that asylum seekers are the enemy to be intercepted, detained, and deterred. Notably, the former Department of Immigration and Citizenship (DIAC) was renamed the Department of Immigration and Border Protection (DIBP), indicating a clear move towards the portrayal of asylum and refugee seekers as a threat to Australian territory. Asylum seekers who arrive in Australia by boat without a valid visa are subject to a system of third country processing, whereby they are transferred to an offshore detention centre. Those arriving by boat are therefore penalised significantly, despite the truth being that many escaping from the direst of situations would find it virtually impossible to obtain travel documents or to travel by plane. 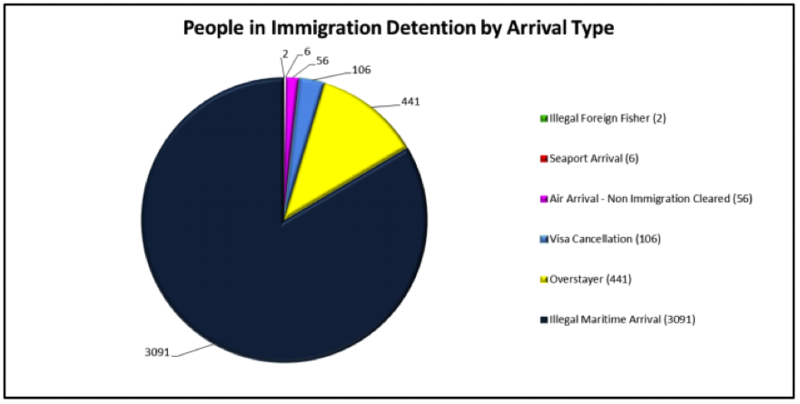 As at 31 July 2014, DIBP statistics indicated that 3091 people arriving by boat were held in immigration detention. Of those, the DIBP reported a total of 1146 at the Nauru Island detention centre; 695 men, 268 women, and 183 children. At Manus, 1127 men were held. The Australian government’s stated goal is to make this transfer within 48 hours of arrival. The mandatory nature of this detention regime arguably violates the ICCPR and the CRC which state that detention should not be arbitrary; rather, each person should be individually assessed as to whether they pose an unacceptable risk to the community and whether less restrictive means could be used. Further, such a short time frame has been criticised as being insufficient to carry out adequate health checks or screen for communicable diseases, thereby amplifying the appalling health conditions in the detention centres. Manus Island houses men who do not arrive with their families, including some unaccompanied boys under the age of 18, many of whom are transferred there from Christmas Island. A study by Amnesty International published in December 2013 found that such removals are carried out with little or no notice and limited explanation. Asylum seekers have reportedly been pressured into signing statements that the transfer is voluntary. Further, the study found that since the Manus Island facility opened in November 2012, no asylum seeker held there had yet received a Refugee Status Determination. The rampant failure of the Australian government to provide effective judicial remedy, along with its arbitrary and indefinite detention process was found by the UN Human Rights Committee in 2013 to amount to “cumulatively inflicting serious psychological harm upon them”. These findings were largely ignored by Australia. The recent violence in Manus Island in 16-18 February 2014 which resulted in the death of one asylum seeker and serious injury of many others highlighted the discomfort faced by those detained for long periods of time; there, it had been almost 18 months since the first transfers to Manus took place with no refugee status determinations or resettlements. On 19 July 2013 and 3 August 2013, the Australian Government entered resettlement agreements with the Governments of Papua New Guinea and Nauru respectively, to the effect that asylum seekers transferred there will remain there while their claims are processed and will later be resettled in those countries if their refugee claim is successful. Such resettlement has been argued to be wholly at odds with the principles of refoulement due to the indefinite time period for the Refugee Status determination process, poor living conditions, and the poor human rights record existing in these countries. At present, a similar agreement is close to being concluded between Australia and Cambodia, which would allow the Australian government to move those who have been granted refugee status on Nauru to Cambodia. This has been criticised by the United Nations Refugee Agency (UNHCR) and the Cambodian Human Rights Committee (CHRA), both of whom have expressed concerns about the lack of rights of refugees and asylum seekers in Cambodia, and the fact that Cambodia is still recovering from civil war. Indonesia has become the transit point for people-smugglers who ferry asylum seekers to Christmas Island. Asylum seekers, mostly from Iraq, Afghanistan, Pakistan, Sri Lanka and Myanmar, first face reportedly dire conditions in Indonesia’s immigration detention centres. Many of these centres are funded by Australia. However, their plight does not end there. Under the Abbott government’s Operation Sovereign Borders, the Australian Navy have been ordered to turn asylum seeker boats back to Indonesia when it is deemed ‘safe’. In February 2014, footage was released of a lifeboat being towed by an Australian vessel back to Indonesia. The Australian government has reportedly been stated to pay Indonesians to act as informants on people-smuggling operations. This policy brings into question Australia’s compliance with the laws of the sea where boats are unseaworthy causing risk to passengers’ lives, and to its non-refoulement obligations under the UN Refugee Convention. Further, the Australian government has allegedly returned asylum seekers having assessed and rejected their claims at high seas by a videoconference, bringing into question the lack of fair opportunity for an individual to fully present their case. The secret screening and detention processes taking at sea in this regard have further attracted grave concern as to the human rights violations and treatment of the asylum seekers found on the boats. Reports by ABC on 22 January 2014 showed asylum seekers being treated for burns on their hands, which were allegedly caused by being forced to hold a hot exhaust pipe on the boat as punishment for protesting about access to the toilet. Currently, Australia’s Immigration Minister Scott Morrison has dictated a refusal to process refugee claims of around 30,000 asylum seekers until the Senate allows Temporary Protection Visas (TPVs). Meanwhile, the majority of these asylum seekers will be forced to remain in detention facilities for an indefinite period. At present, two class actions are pending against the Australian government. Sick and injured asylum seekers detained in Christmas Island are suing Australian Government for failing to provide medical care. At the centre of the action is a girl aged six by the name ‘AS’, who has been detained for more than a year and was suffering ongoing dental infection, allergies, separation anxiety and bed wetting after being separated from her mother for an extended period. 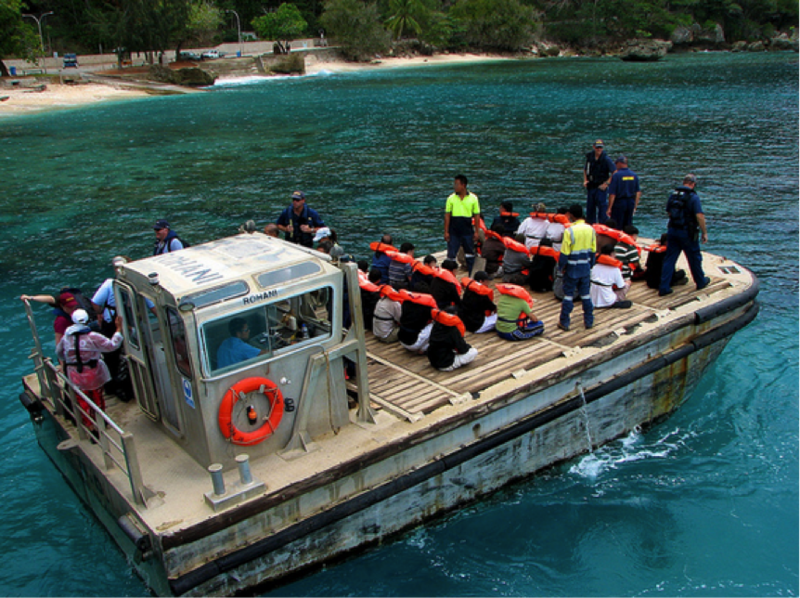 Further, a special case hearing is to be held in the High Court in October 2014 to determine whether the Abbott government acted lawfully under the Maritime Powers Act when it detained a vessel with 157 Tamil asylum seekers, transferred them to an Australian vessel and held them outside Australia’s territorial waters while seeking Indian cooperation to repatriate them. Concerns have been expressed about the accommodation at Regional Processing Centres, which consist of tents reportedly being used to house up to 14 detainees each. Such accommodation has been deemed wholly unsuitable to tropical conditions, with no air conditioning exposing inhabitants to infectious mosquitoes. 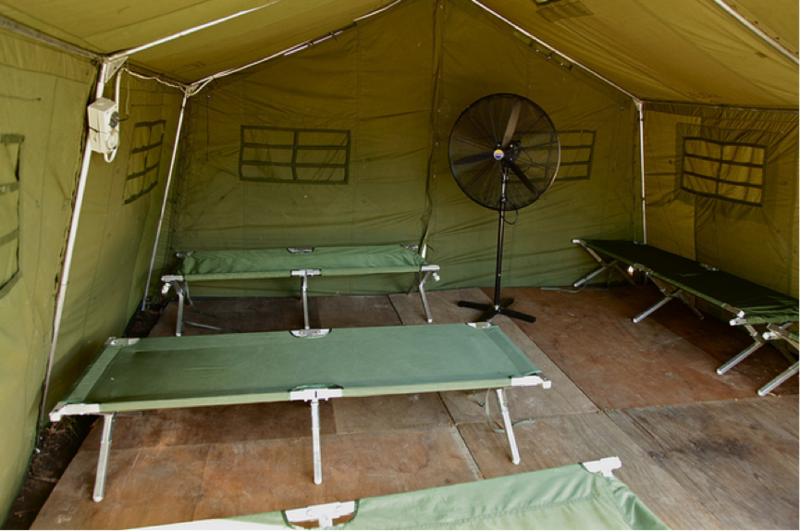 Australia’s detention policies moreover fail to put into place adequate infection control measures, and in fact Manus Island is rife with malaria and other serious diseases. Reports have further criticized the lack of safe drinking water in Nauru and Manus Island. Inhabitants are allegedly without water for essential daily activities further amplifying the already unsanitary conditions. Australia’s failure to provide adequate water to the inhabitants of its offshore detention centres has been heavily condemned, with the Human Rights Council emphasizing that water is an essential right for the full enjoyment of life and human rights, and delegation of water obligations to a third party does not exempt states from human rights obligations. Further, this arguably breaches its international obligations of health equity and economic and social rights, which extend to extraterritorial situations over which it exercises authority or effective control. 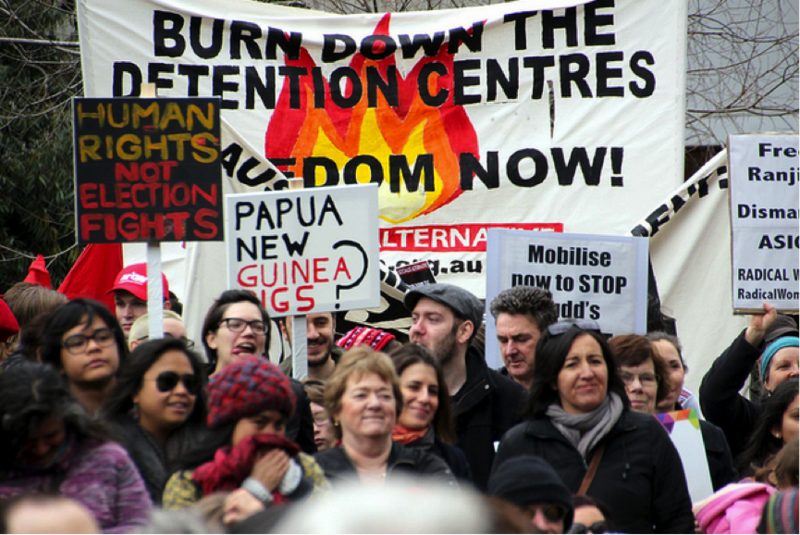 A recent news report on 3 September 2014 highlighted the abhorrent health conditions rampant in these detention centres. A 24 year old Iranian asylum seeker Hamid Kehazaei was declared brain dead, after developing septicemia from cutting his foot approximately 3 weeks earlier at the Manus Island offshore processing centre. It is stated that he sought medical attention for days for the pain and infection, yet was only taken into intensive care in a Brisbane hospital 2 weeks later. Refugee Action Coalition spokesman Ian Rintoul said authorities took too long to act and Kehazaei suffered a heart attack before being declared brain dead on 2 September 2014. An area of particular concern has been the treatment of women and children within the detention centres. Children face mandatory detention in these locations contrary to Australia’s obligations under the Convention on the Rights of the Child (CRC), which states that children should only be detained as a last resort and for the shortest possible time. Mental illnesses and suicide attempts are rife amongst this demographic. 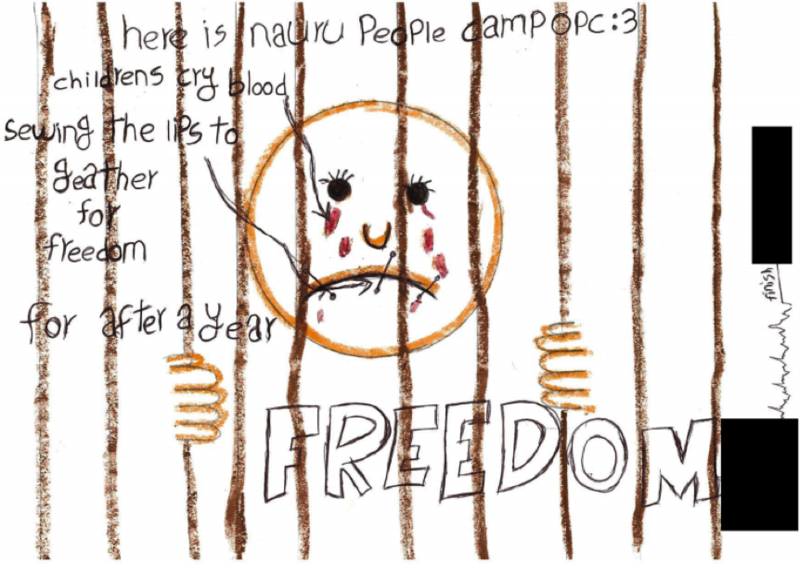 Approximately 500 children who arrived in Australia after 19 July 2013 remain in indefinite detention, with deteriorating mental health. Dr Young, former director of IHMS mental health services has stated that the conditions faced by detainees are akin to torture. An inquiry led by the Australian Human Rights Commission in July 2013 highlighted the atrocious conditions endured by women and children in Christmas Island. In their report, they found 13 women on high-level risk monitoring in Christmas Island, 10 of which required 24-hour watch by a guard who sits outside their room with the door open. Women were observed at all times including when they breastfed and slept. Babies were confined in 3×3 metal containers in extreme heat with no clean, open or safe areas to learn to crawl. Most children were reportedly ill with chest or gut infections. Internationally respected Professor Elizabeth Elliott stated that Christmas Island’s proximity to a phosphate mine means that the physical environment was ‘totally unsuitable and children suffer from recurrent asthma and irritation of the eyes and skin is common’. A damning example of the uninhabitable conditions at Nauru Island was seen in reports of three pregnant asylum seekers who had been transferred to offshore detention on Nauru requesting abortions, citing conditions in detention and the longevity of the time held there as reasons. During the period January 2013 to 31 March 2014, the study found that 128 out of the 2000 children in detention, and 89 adults self-harmed. Abbott’s response, when asked about mother’s self-harming, was that: “…this is not going to be a government which has our policy driven by people who are attempting to hold us over a moral barrel. We won’t be driven by that”. Alarmingly, the statistics relating to detention centre conditions may represent merely a small fragment of the real picture. The Australian government now actively blocks journalist from Manus Island detention centre and deletes journalists’ photos. Asylum seekers on Manus Island are denied internet and phone connections. The Australian Human Rights Commission and Immigration Ombudsman have been denied access to Manus and Nauru. Dr Young has himself admitted that the Immigration Department asked him not to report on the rates of mental disorders amongst young children. Moreover, fundamental ethical problems are presented for doctors, with HMS staff possessing the dual role of treating detainees but also reporting to the department. The lack of transparency and accountability raise grave concerns of the behaviour of the Australian government in a democratic society, and the difficulties in enforcing any international standards in this regard. Yet, what the Abbott government fails to appreciate is the fact that those fleeing persecution and abhorrent situations in their home countries are in fact an important humanitarian matter rather than a national emergency. Accordingly, it is difficult to fathom why the government would consider the matter one requiring public interest immunity. 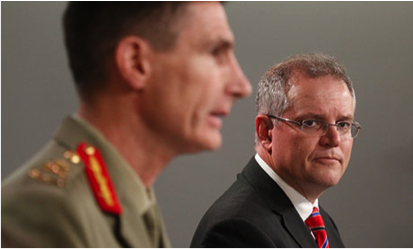 Moreover, the fusion between the military and the government, with Campbell directly to Morrison rather than to the Chief of Defence through the traditional chain of command, arguably places him under undue political influence. These concerns were expressed by the Australia Defence Association, who emphasised the fact that border control is a civil law enforcement problem rather than a military problem, and stated doubts over dragging the Defence forces into party-political controversy. The current policies of the Australian Government’s Operation Sovereign Borders to ‘stop the boats’, along with the mandatory transfer of boat people to deplorable conditions within the offshore detention centres pose a monumental lack of regard for human rights and international instruments. The veil of secrecy surrounding the operation is unnecessary, and casts doubt over the actions taken under the Abbott government both at sea and within detention centres. Such secrecy is at odds with the principles of democratic governance and accountability, and highlights the erroneous portrayal by the government of asylum seekers being a national emergency akin to a war situation. What is clear, however, is that flagrant human rights abuses are occurring both at sea, and within detention centres. Health and sanitary conditions, indefinite detention periods, the treatment of children, are all matters of prime concern. There is therefore a pressing need for Australia to re-evaluate their current policies to create a clear and transparent humanitarian agenda in line with international human rights values and its non-refoulement obligations. Al-Skeini v United Kingdom, 55721/07, 7 July 2011. The content and detail within this case study has been obtained from open-source material and has been checked, as best as is possible, for accuracy by the authors at the time of writing. All quotes, pictures and diagrams have been acknowledged where able and any omissions or factual inaccuracies may be alerted by writing to: info@humanrightsatsea.com. The opinions, perspectives and comments are those of the authors. The Human Rights at Sea (HRAS) initiative has been independently developed for the benefit of the international community, including the maritime industry, for matters and issues concerning human rights in the maritime environment. It is a work-in-progress having been launched on the 3 April 2014 in London by the Founder, David Hammond.